Here, Kim Marlor talks about how it’s really important to know how to position your business and know what makes you different to your competition and hence why your client or customer should buy from you! 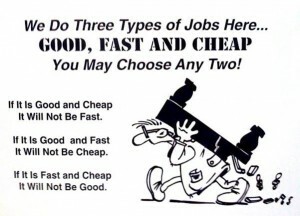 It’s ok to be good, fast or cheap but if you want a successful business it’s not all possible at the same time! This entry was posted on Friday, August 17th, 2018 at 10:57 am and is filed under Knowledge Centre. You can follow any responses to this entry through the RSS 2.0 feed. Both comments and pings are currently closed.